After a long day of business meetings or outdoor recreation, who wants to head out in search of a good meal? While other area hotels only offer breakfast, Ramada Williston is proud to feature a full-service bar and lounge and limited service restaurant. Mornings begin with our daily breakfast: including complimentary continental breakfast or our cooked-to-order American breakfast for an additional charge. 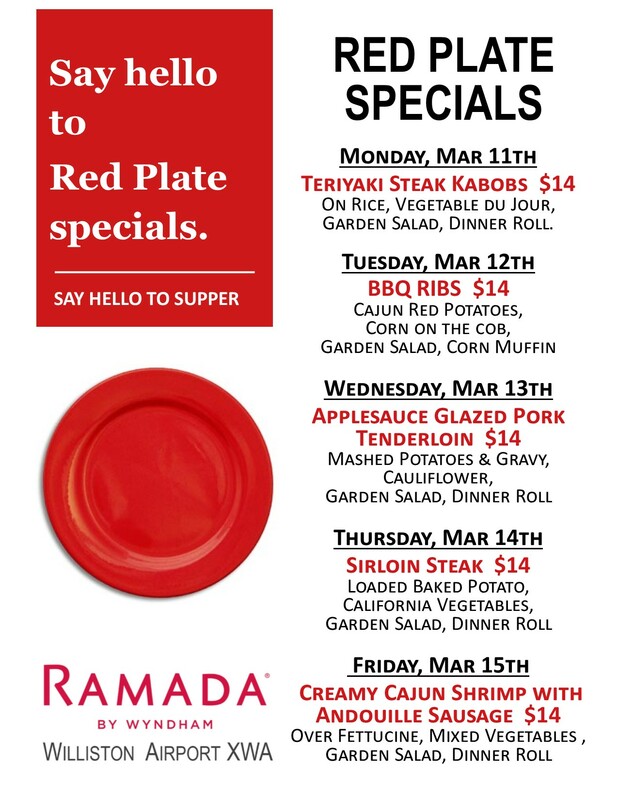 "in the evening, enjoy our extensive take-out menu, featuring a wide selection of comfort food classics from 5-10pm daily"
Here at Ramada we serve a delicious hot breakfast every morning. Don't have time to dine in for dinner? Take it to go and be just as satisfied! Loved the stay. The breakfast in the morning was a great way to start the day. The front desk personnel were always helpful. Accommodations were clean and plentiful - game room, exercise room, food buffet, etc. Staff was friendly and helpful - tips on places to eat and reading suggestions. I have stayed at the Ramada Williston on several occasions, and each time the experience improves. The staff seems more permanent, and they truly want your stay to be great. They always seem to go the extra mile. Having a great food option and a on-property bar sets the Ramada apart. I highly recommend it for a good mid-range value hotel. Not ready to turn in? Head to the lounge for a game of pool or a televised game on the big screen, along with bar bites and brews.